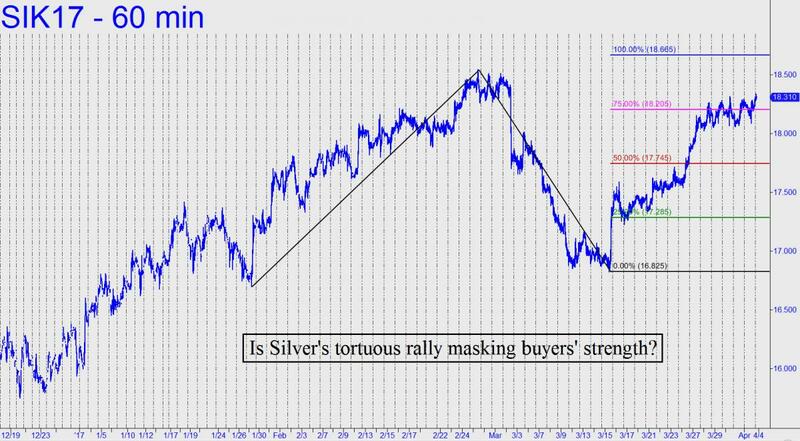 Is Silver's Tortuous Rally Masking Strength? Silver’s hourly chart looks more impressive than gold’s at the moment, since Monday’s strong rally exceeded a clear and formidable Hidden Pivot resistance at 17.990 as though it were not there (see inset). Also, because the move surpassed an external peak at 18.010 recorded on March 3, for trading purposes we’ll have our choice of impulse legs all the way down to 17.460, a prospective point ‘A’ recorded on March 20. I’d like to see some more correction action before we decide which one to use. Whatever happens, the rally off the next pullback low would need to exceed March 2’s very important ‘external’ peak at 18.510 to keep bulls’ winning streak going. _______ UPDATE (Mar 29, 1:25 a.m. EDT): Here’s an encouraging chart that shows a rally target at 18.665. I’d have preferred that buyers had demolished the 17.745 midpoint pivot the first time they encountered it, but it actually took three days to leave it behind. That somewhat diminishes the power we might impute to the move, but it is not sufficient to impair a bet that 18.665 will be reached. It looks like a 50-50 bet to me at the moment. _______ UPDATE (Mar 30, 6:49 p.m.): No change. Silver’s intraday charts continue to look significantly better than gold’s. _______ UPDATE (Apr 3, 9:45 p.m.): There’s nothing at this point to make one think silver won’t eventually reach the 18.665 rally target we’ve been using since, like, forever. But couldn’t bulls have accomplished this modest feat with a little more brio? In any event, we’ll need to see a decisive thrust past 18.665 before we can infer confidently that buyers have been masking their strength. If so, that would be a great way for a monster rally to take off, since there will be plenty of skeptics who are NOT aboard as it leaves the launching pad. (Click here for a fresh chart. ).